In a YouTube video taped at a concert in Caracas, Venezuela, on New Year’s Eve 2007, the power of music is vividly on display. The Simon Bolivar Youth Orchestra and the Venezuelan Brass Ensemble — an unusually large group on one stage — are playing the “Mambo” from Leonard Bernstein’s West Side Story, and the place is rocking. Audience members of all ages are on their feet, dancing, cheering, clapping, and tossing confetti at the stage. The musicians, having a hard time staying in their seats, manage to shimmy and sway as they play. 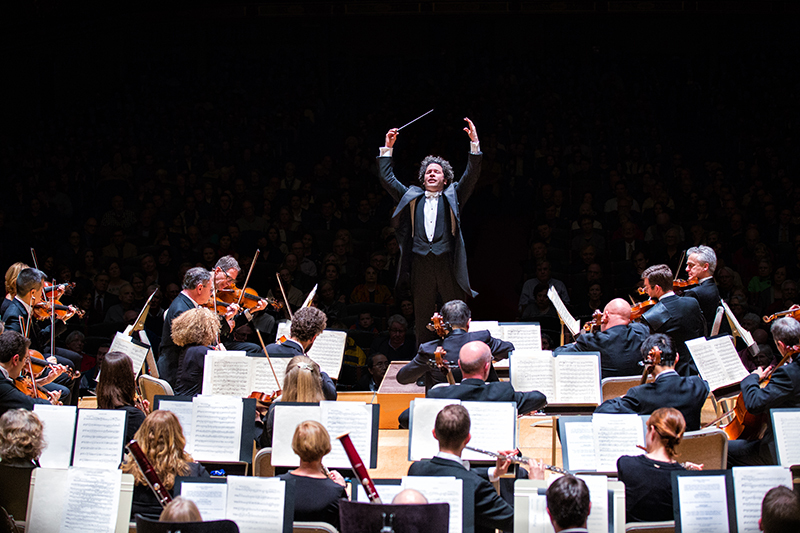 On the podium leading this exhilarating pandemonium is Gustavo Dudamel, the youthful, curly-haired conductor who is a legend in his home country and a superstar in the music world. Now 37, Dudamel is in his tenth season as music and artistic director of the Los Angeles Philharmonic, and his 19th as music director of the Simon Bolivar Orchestra. He makes guest appearances with such distinguished institutions as the Berlin Philharmonic and the Metropolitan Opera. And he always finds time to promote education and social change, working with young people on and off the podium. Starting December 1, Princeton and Trenton will figure prominently in Dudamel’s frenetic schedule. In his first major academic residency, he is coming to Princeton University in three separate visits this season, continuing through the end of April. This remarkable arrangement celebrates the 125th anniversary of Princeton University Concerts, and the local arts community is abuzz. 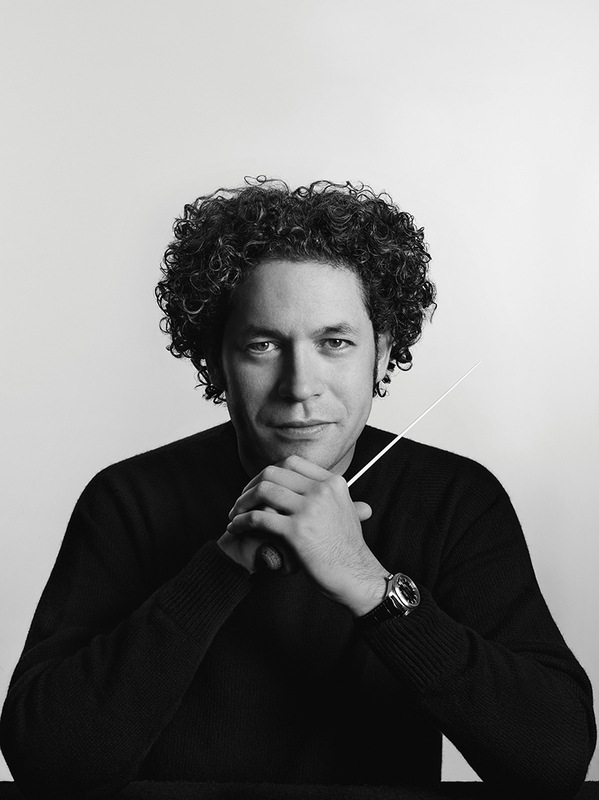 Dudamel’s time on and off campus will include concerts, recitals, panel discussions moderated by him, art exhibits, performances by the Princeton University Orchestra and Glee Club, members of the Berlin Philharmonic, and numerous other musicians, artists, and educators. But it is probably safe to say that the April 28 seminario, with hundreds of New Jersey students from initiatives inspired by El Sistema, the program that brings music into the lives of children in vulnerable communities, is at the top of the conductor’s list. 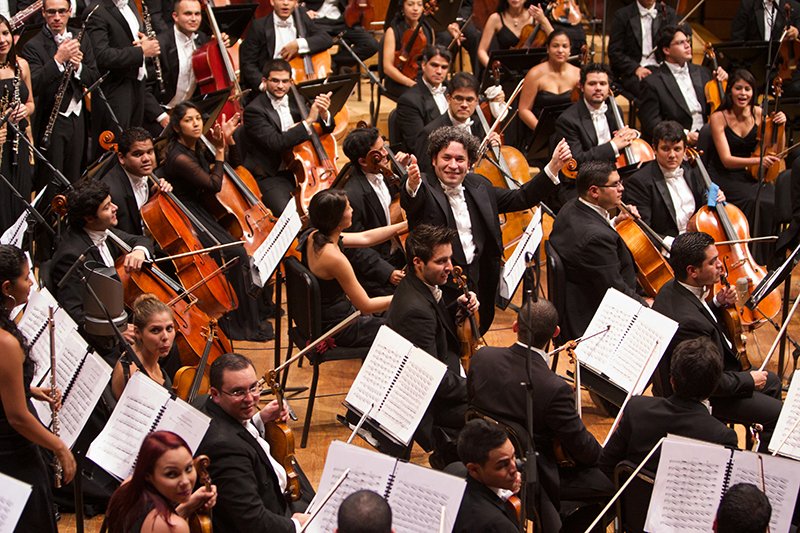 Dudamel is considered the world’s leading proponent of El Sistema, formerly known as the Foundation for the National Network of Youth and Children Orchestras of Venezuela. This innovative program, in which music is the primary avenue for social and intellectual improvement, was founded in 1975 by musician and economist Jose Abreu. According to some statistics, more than a million children, many from underprivileged circumstances, have taken part in programs in Venezuela and beyond. Aware that the town already has significant ensembles such as the Princeton Symphony Orchestra and the Princeton University Orchestra, Seltzer and her colleagues decided it didn’t make sense to just bring in a touring organization. 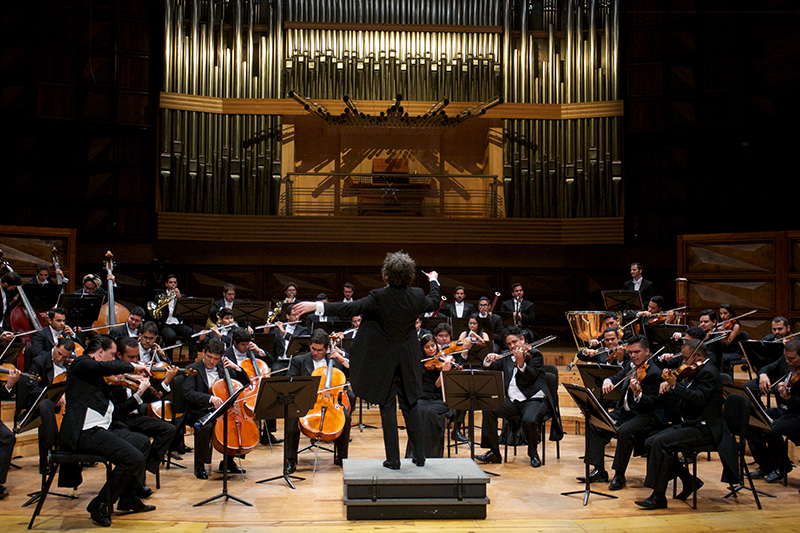 “But one of my first thoughts was, wouldn’t it be amazing to present the Simon Bolivar Youth Orchestra? It seemed like a niche, and a way for us to celebrate with a bit of a different take,” she says. The schedule for the residency continues to evolve as Seltzer and her colleagues try to keep up with Dudamel’s ideas. What is certain is that events will kick off Saturday, December 1 with a Venezuelan musical party and performance at Richardson Auditorium. The opening weekend continues with a Dudamel-curated concert by El Sistema students from Boston, a panel discussion between the conductor and Harvard Dictionary of Music editor Don Michael Randel on music, education, and social change with an emphasis on Latin America, and more. In addition to the public events of the residency, Dudamel will spend time in classrooms on campus and in Trenton Public Schools. A concert at Richardson Auditorium on April 26 in which he conducts the Princeton University Orchestra and Glee Club is sold out, but a free repeat performance will be held the following day at Patriots Theater at the War Memorial in Trenton. Dudamel is only too aware of the poverty and unrest currently going on in Venezuela, but he is hopeful for the future. For a schedule of events included in Dudamel’s residency, visit princetonuniversityconcerts.org.